During the night of October 8th, Santa Rosa, California, found itself pinned between two wildfires. To the southeast, the Nuns fire burned west of Highway 12. To the northeast, the Tubbs fire charred the hills outside Calistoga and worked its way southwest. In Santa Rosa, the latter would prove the more devastating. 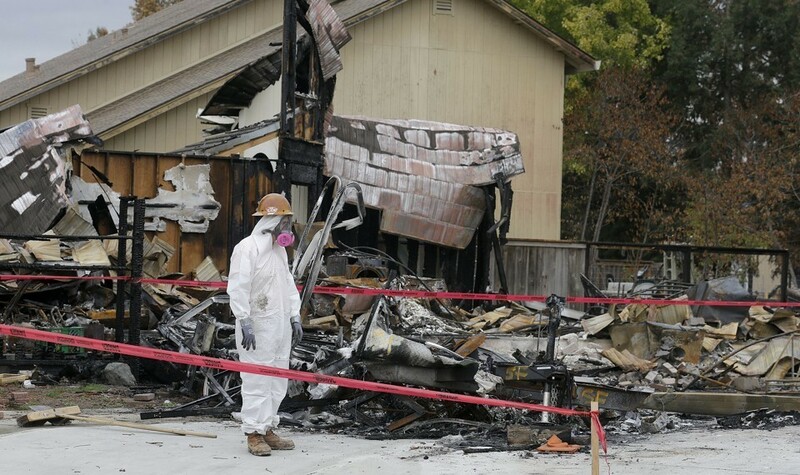 The Tubbs fire tore through the wealthy community of Fountaingrove before jumping Highway 101 and claiming about 1,500 homes in dense, working-class Coffey Park. By the time they were contained at the end of October, a spate of fires around the North Bay had claimed more than 40 lives and 5,700 buildings. Even before the fires, low-wage laborers and an estimated 28,000 undocumented workers struggled to eke out a living in an area with an exceptionally high cost of living. Now, the question facing them is not how they will rebuild their lives, but whether they can at all.The morning after the fire devastated Coffey Park, a line formed outside the Graton Day Labor Center west of Santa Rosa. Disasters “always make new day laborers,” said the center’s director, Jesus Guzman. The Graton center is part of a national network that includes offices in New York City and New Orleans, and Guzman said his sister locations reported similar lines during the days following Hurricanes Sandy and Katrina. Some of those looking for work were farmworkers whose fields had burned—Sonoma County is the nation’s largest producer of wine—but even more had been employed in some corner of the region’s fast-growing tourism and services industries. The flames claimed a nursing home, a Kmart, Best Western and Hilton hotels, and many other businesses on which low-wage workers had depended. Guzman’s mother was among them. A house cleaner for decades, she worked for clients in affluent neighborhoods like Fountaingrove. At least two of her clients lost their houses there, Guzman said. One has decided to move away, but the other will rebuild and has promised to get his mother back to work when the new home is finished—which could take years.Unemployment is only one part of the problem. “There’s work in Sonoma County, but even $15 an hour in agriculture isn’t going to cut it to pay rent here, and it’s only going to get worse,” Guzman said.That’s partly because the housing market is dismal for working-class residents, he added. Forbes recently named Sonoma County the country’s 10th-least affordable place to live. A person earning an average wage in the county would have to spend about 82 percent of it to live in a median-priced house. To make ends meet, many low-income families share housing, with sometimes as many as 20 people to a home, Guzman said. According to the real-estate site Zillow, the median monthly rent in September was $2,366, a figure that has been steadily increasing for years. Only about 2 percent of Sonoma’s housing stock was available before the fires destroyed thousands of homes, said Raissa de la Rosa, the economic development manager for the City of Santa Rosa. Much of the housing stock is taken up by vacation homes, and the homes that were available were out of reach for many prospective residents.“Housing was a priority before; now, it’s a super-priority,” de la Rosa said. The fire claimed about 5 percent of the city’s remaining housing stock, leaving thousands displaced. According to Guzman, many people “don’t have a lot of hope they’ll find anything. It was hard enough to find something in the first place.”Even before the fire came over the ridge, Santa Rosa was working toward incentivizing denser, more-diverse housing downtown, de la Rosa said. The city’s housing action plan, already in place, focuses on affordable development. But then it lost more housing than it built last year. In the weeks since the blaze, median monthly rent in Sonoma County has jumped 35 percent to $3,224, in response to new demand from displaced residents. This prompted Santa Rosa to install a cap on rent increases to combat price gouging. In mid-October, Santa Rosa and Sonoma County issued a series of emergency ordinances designed to speed the process of rebuilding and protect those who were displaced. The new policies waived processing fees for burned structures, suspended new vacation rentals, allowed people to live in temporary housing like RVs and trailers, opened up restrictions on secondary units, and extended occupancy rules to allow seasonal farmworkers to stay year-round. De la Rosa said the city had more than 3,100 units in the pipeline in some way before the fire; her office is now looking at which of those can be pushed through the fastest. Among those leading the charge is Rebuild North Bay, a public-private partnership established by the influential Sacramento lobbyist and real-estate magnate Darius Anderson. Acting as executive director is James Lee Witt, a former FEMA director whose otherwise respected disaster-relief company was the subject of an eight-month NBC News investigation into profiteering in the wake of Hurricane Katrina. In a recent press conference, Witt said he intends to work closely with local representatives to identify needs and act quickly. Already, the disaster is spurring debate on how—and even if—some areas should be rebuilt. Recovery presents opportunities to start over in some areas and address housing inadequacies with equity and sustainability in mind, but some worry a hastened rebuilding effort could favor high-end developers and wineries.“We’re acutely aware of disaster capitalism and how this community can be exploited in a way that can make a few people money,” said Annie Dobbs-Kramer of the North Bay Organizing Project. Her organization is pushing to include working-class people in the restoration plans, with affordable housing and tenant protection at the top of its list.In Sonoma, where rents significantly outpace wages, rent control has been a divisive topic. In 2016, Santa Rosa City Council passed a rent-control ordinance that immediately earned the ire of landlords. In June 2017, a signature-collection effort plagued by accusations of fraud forced a referendum. Rent control opponents, led by the National Association of Realtors, a trade group, outspent housing-rights proponents five to one—and broke city campaign-spending records in the process, the Press Democrat reported. The rent-control measure was defeated by 781 votes. It’s too early to tell how recovery efforts will shake out or how many of Sonoma’s low-income families will stick around. Meanwhile, the region has been flooded with relief funds. A coalition of immigrant rights groups including the North Bay Organizing Project has launched Undocufund to raise money for undocumented immigrant workers who do not qualify for FEMA assistance and face procedural and language barriers to accessing aid.